Steel structures may never entirely replace gunite shells for competition pools, says Joe Esser of Kiefer Pool & Equipment Co., but the ease of construction and durability of stainless vessels make it an interesting race to watch – particularly because steel opens competition-pool projects to a much wider range of builders. To demonstrate the whys and hows, he leads you through the construction process step by step, showing just what it takes to assemble these modular marvels. It used to be that competition pools were the sole province of big engineering/construction companies with their substantial assets, impressive inventories of equipment, huge labor forces and established skills in working with low-tolerance plans and specifications. The arrival on the scene of modular stainless steel pool systems has changed all that – and it’s a good thing, because so many competition and training pools are being built today that there are not enough qualified construction companies of the traditional sort to get around to installing them all. This boom is a product of both the popularity of aquatic sports and the hot economy. If a university or city can live with higher prices and construction delays, they’ll wait for traditional concrete construction, massive shells and formed gutter systems. As an alternative, they can move on to investigate systems such as the one seen in this article – fully modular systems that can be installed by just about any competent contractor. Even better, they can get a stainless steel construction pool when they want it and generally at significantly lower cost – 10% to 20% less, in fact – than would be the case for a concrete vessel. Stainless steel pools are nothing new, nor are stainless steel gutters. In fact, companies like ours have been installing stainless steel pools and gutter systems with concrete floors for commercial customers for more than 25 years. Back then, the process required a staff of competent welders to assemble the steel panels, a circumstance that made the jobs just as challenging as installing a traditional gunite structure, if not more so. The type of steel-vessel construction described in the accompanying article has been used in a variety of high-profile competition facilities – most notably the Olympic water polo pool installed at Georgia Tech for the 1996 Summer Olympics in Atlanta. This pool was assembled just a few weeks before the games in a site adjacent to the main competition pool and stadium. After the games, the water polo pool was dismantled and removed. That’s a key point: While these stainless structures can be as permanent as concrete pools, they can be assembled in a fraction of the time and can easily be disassembled and moved as need arises. Obviously, this took the work out of the hands of pool builders whose primary medium was reinforced concrete. 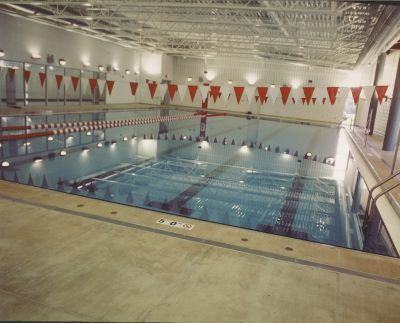 Despite the small number of firms installing these pools, however, a significant number of commercial pools of the welded-steel type were installed nationwide and gained credibility from the fact that the aquatic centers at universities including Ohio State and Bowling Green featured them. Later, as an alternative to welded construction, companies such as Clayton & Lambert made concrete-bottomed, stainless steel pools that relied on gaskets, not welds, to prevent the pools from leaking. The systems worked, but the skimmer-type vessels were limited to about 3,500 square feet in size, making them too small to serve as competition pools, which traditionally have gutters. More recently, advances in modular engineering by our firm and others have resulted in easy-to-assemble structures that can easily be made of sufficient size for swimming, water polo or synchronized swimming competitions. As you’ll see in the accompanying how-to photographs, these modern structures feature modular wall and gutter pieces; a heavy base frame that serves as a foundation for the 3-foot wide wall sections; adjustable wall braces that attach to each panel joint; and a PVC-reinforced membrane that seals the floor of the pool. 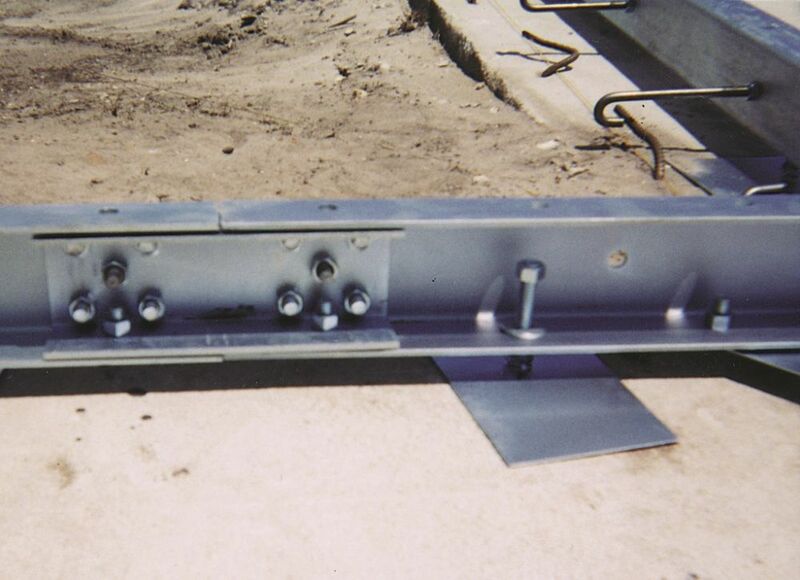 Once the concrete cures, a heavy-duty steel base channel is assembled on top of the footing (left). To simplify the process, the base-channel sections have alignment holes used in forming either 90- or 45-degree corners (middle). 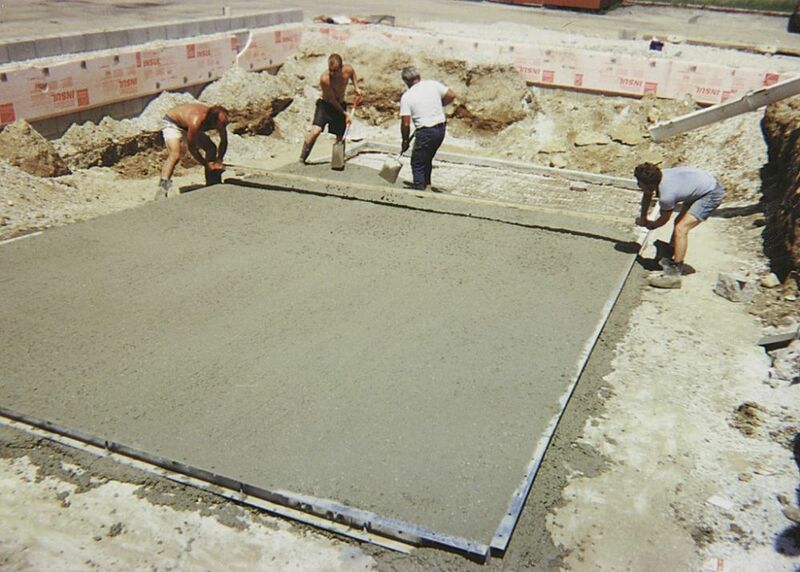 Once they’re squared within an eighth of an inch, leveling pads are shot-anchored into the cement to hold the channel in place and keep it square (right). The next step involves leveling the channel to within a sixteenth of an inch with a laser level. This is best done at night, when you can see the laser level “spin” around the perimeter. Now the base channel is lowered or raised using its adjustment lugs. 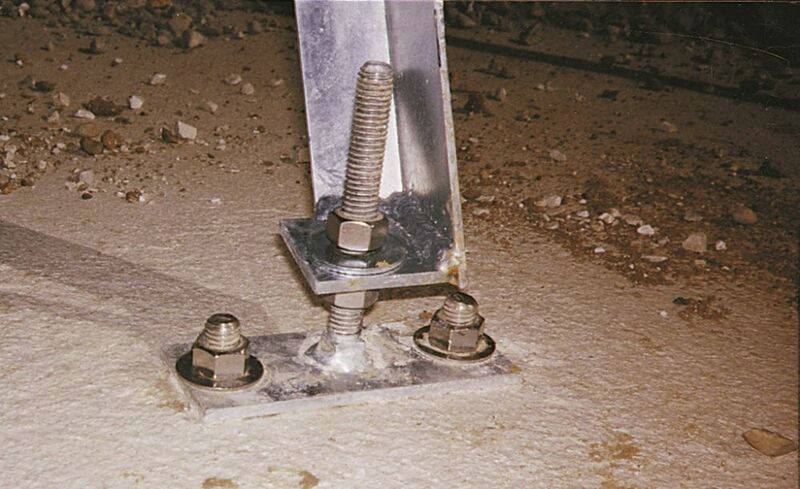 Once leveled, locking nuts are set and twisted together to lock the base channel at the desired height. With the foundations in place, it’s time to install plumbing for the floor inlets and main drains (left). 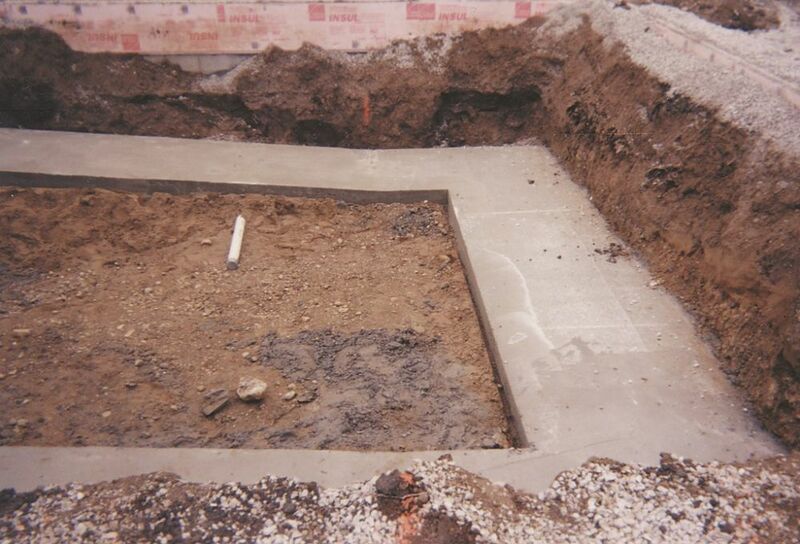 Next, a cement floor is poured between the perimeter-base channels to lock the entire assembly together (right). 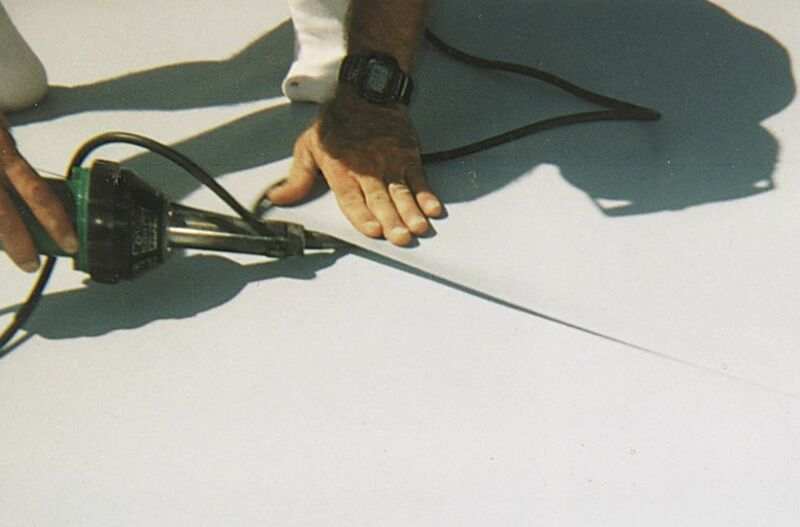 Once the concrete has cured, a reinforced PVC membrane in 12-foot-wide rolls is installed across the floor of the pool to act as a gasket on top of the base frame. Now the walls are assembled on top of the base channel. The wall panels are 3 feet wide and up to 9 feet tall. 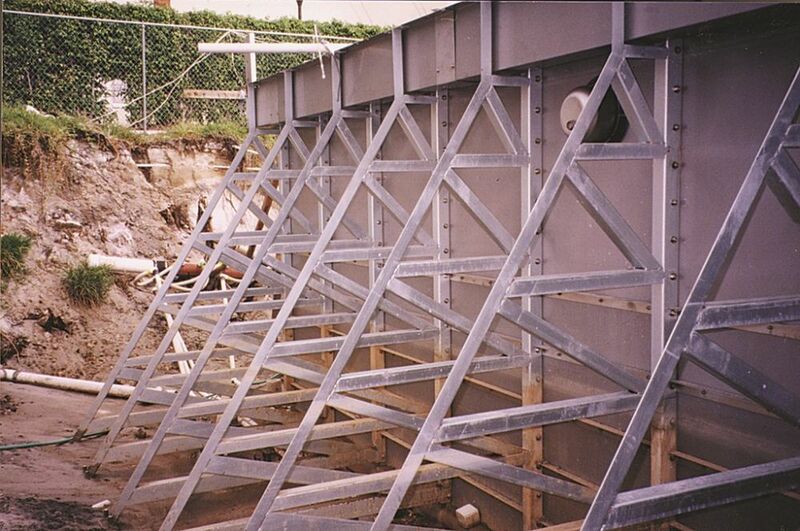 At each panel joint, we use a heavy-duty brace to hold the wall perfectly vertical (left). 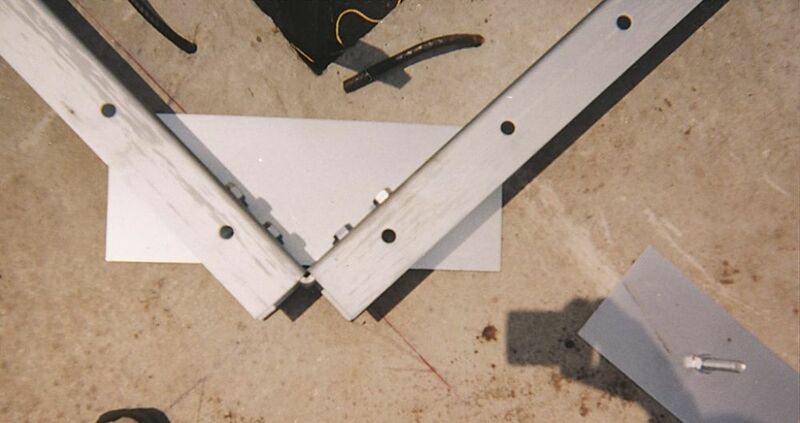 If a gutter is used, as it is in this case, the sections fit into a supporting brace assembly seen at the top of the photograph. The massive braces supporting the 9-foot panels shown here (on a competition pool in Ft. Lauderdale, Fla.) weigh in at 185 pounds each. 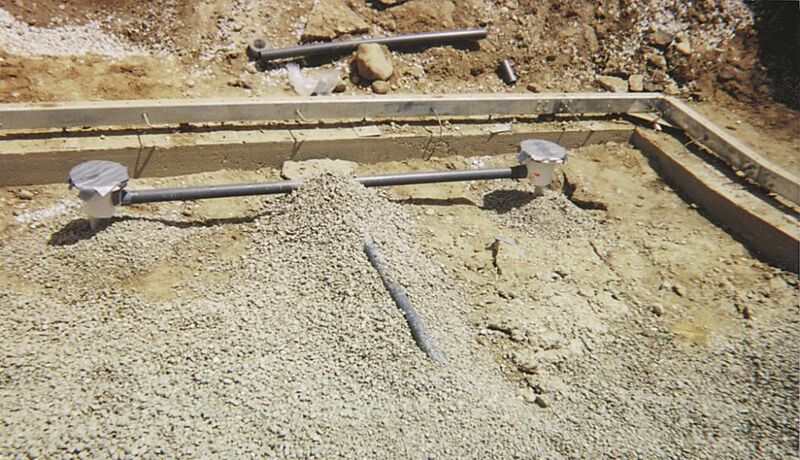 The braces are attached to the footings with heavy “thunderstuds” (also known as concrete expansion anchors) that have been hammer-drilled into the cement (right). At this point, the walls are perfectly square and straight. The vertical level may need adjusting at this point; if necessary, this is accomplished by turning the leveling nuts. The pool is basically finished. In this case, the pool was filled with water before backfilling was completed to make certain there were no leaks. After that, all that remained was detail work, including installation of gutter grates and racing-lane floats – and, of course, the decking and enclosure. Joe Esser is the Midwest regional sales representative for Kiefer Pools & Equipment, a manufacturer based in Zion, Ill. Esser has been involved in the swimming pool industry for 26 years, working for a wide variety of firms in positions ranging from construction and service to project management and distribution for the commercial pool market in the upper Midwest states. In his current capacity, he is often called upon to supervise projects featuring construction of modular stainless steel shells.